 Pseudolilium contortum | Pandorapedia: The Official Guide to Pandora | Own AVATAR on Blu-ray & DVD Now! The bright radiating lines on the leaves mark the location of primitive sensory cells that converge at the petiole and travel down the length of the plant. When a living organism approaches, the cells bioluminesce brightly, sending a signal to the rest of the plant. This signal triggers a rapid twisting movement of the main stem in the direction of the intruder, who can be slapped by the leaves if he doesn’t quickly move away. The slapping leaves of the twisted lily are deliberately provoked for fun by young Na’vi and in all seriousness by adults as a fitness and training exercise. Botanical Description Herbaceous plant with twisted rope-like stems and large rounded heart shaped leaves on long petioles. Leaves bioluminesce in lines radiating out from the point of attachment with the petiole. Ecology Plants have sensory cells in leaves that detect presence of living organisms. These sensory cells place twisted lily in category of “zooplantae.” Contractile stems react by twisting towards living being, which is slapped by leaves if standing too close. Ethnobotany Twisted lily is used as fitness challenge and game for youngsters.